The questions related to a strategy are fundamental ones. We can talk a lot about vision, objectives, and KPIs, but the ultimate goal of these discussions is a well formulated strategy that will be successfully executed later. 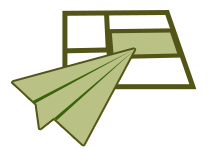 On the on hand, there is no sense in searching for a common algorithm or template; such a template doesn’t exist, as the final strategy is always tailored to the company, on the other hand, there are certain strategy definition and description techniques that must be in the toolkit of any executive. The Balanced Scorecard (BSC) is a popular business tool these days, but still companies fail to implement it correctly. There are various reasons for this, one is that in the minds of business professionals the Balanced Scorecard is frequently associated with 4 perspectives and a respective 4-sector diagram. According to what one can find on the Internet, the Balanced Scorecard is about seeing businesses using the prism of Finance, Customers, Internal Business Processes, and Education and Growth perspectives. That’s true, but that point of view is very superficial. MBA graduates use BSC in a way that is very similar to SWOT analysis. They treat BSC as a new paradigm that provides different perspectives to evaluate the business. However, with this approach it is neither possible to describe a strategy well, nor to execute this strategy more effectively. In contrast, in the “The strategy focused organization” authors of the Balanced Scorecard concept share many theoretical and practical guides on how to describe strategy ideas. The approach is not as simple as “use these 4 perspectives,” but once studied carefully, it can help to describe the strategy and ensure its implementation. With the Balanced Scorecard and particularly with a strategy map, one won’t find answers to the “how” question. The concept won’t help to make an educated guess about what needs to be done, but with the BSC method one can use a good structure to describe the strategy. The idea is to focus on one of these strategies, to make it a core competence, but at the same time the other strategies should be executed on a good level. Focusing on one strategy don’t mean forgetting about other options. McDonald’s company with their focus on effective operations (Operational Excellence Strategy). Alcoa where workers’ safety was in the main focus (for me it feels like their focus is somewhere between Customer Intimacy and Operational Excellence). Zappos with their famous “delivering happiness,” where Tony Hsieh created a brand that is focused on a customer intimacy strategy as well. 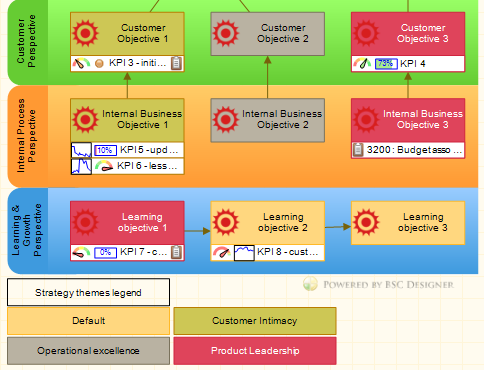 The next logical step is to describe more specific strategies on each level of the BSC. Authors give a list of some generic ideas and respective strategies. Most of them are obvious ones and are good starting points for the further development of the strategy ideas. The focus in the Education and Growth perspective should be on capturing knowledge about customers, understanding customer needs, etc. These objectives are nothing new for any experienced business owner. The main purpose is to underline that the focus on a specific strategy implies the focus on specific objectives and later the focus on specific measures. When the strategy is focused on increasing customer value, then indicators should measure customer satisfaction on service (respectively, benchmarks should be higher than average in industry). There might be some measures of customer satisfaction on price and product quality, but they can be benchmarked to the industry average values. In other words a company knows that customers choose it for its great service, not for the best price offer, and the company continues to follow the same strategy using indicators to make sure that their service is still on the highest level. As it is said in the quote that I used in the beginning of the article, the BSC framework helps to describe the strategy, but not to formulate it. The difference between the primary strategy (a focused one) and the secondary strategies might be blurred. In fast changing business environment one needs to achieve excellence in everything: in customer relationships, in product development and in operations. Excessive focus on only one strategy could ruin the business. Richard Rumelt in “Good Strategy. Bad Strategy”  said: “it would be nice if focus always meant more profits. But it just isn’t so.” A company could describe its strategy as focused, a company could use measures focused on selected objectives, but this doesn’t guarantee a financial success. Another problem might be that the company will stop seeing things (new opportunities), because they are not in the focus of the current strategy. 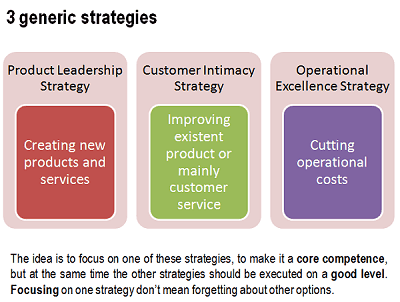 Focusing a strategy and defining the most important competences of the business is a strategy itself. It is not necessary the best strategy. With the Balanced Scorecard and its strategy map one can visualize what business is about, where it wants to go and why. It’s much easier to read the strategy map when there are cause-and-effect connections between business hypotheses. For some businesses the approach might work as a Lego-style strategy constructor for others just as a mean to visualize the strategy that already exists in the business. Some business professionals can adopt the idea of the generic strategies, other might use just the idea of cause-and-effect connected business hypotheses. In any case, having a big picture of the strategy that can be discussed and shared with colleagues is much better than no strategy picture at all. Let’s say we have a strategy map, where we show how intangible and tangible assets of the company contribute to the creation of customer value and financial results. Let’s see how strategic themes can help us to reduce complexity of the strategy map. The strategy map (and respective strategy) given in the book is a template that is a good starting point for the most companies. Each industry has its own nuances, standard strategies and standard measures, that’s why the final strategy is always tailored to the needs of a specific company. The Balanced Scorecard is a business tool that helps to describe the strategy and as a result helps to execute the strategy better. What is your experience with the Balanced Scorecard? Is your strategy focused on one of the default strategies suggested by the authors of BSC concept? ^ The strategy focused organization. How Balanced Scorecard companies thrive in the new business environment. Robert S. Kaplan, David P. Norton, 2001, Harvard Business School Press.